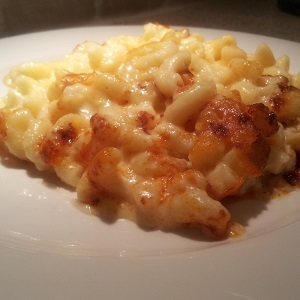 This is an excellent cheesy Macaroni & Cheese that is so easy to prepare. Never buy packaged again. Lots of cheese and sauce baked brown. Cook macaroni according to the package directions and drain. Add milk to roux slowly, stirring constantly so that it does not get lumpy. Stir in cheeses, and cook over low heat until cheese is melted and the sauce is a little thick. Place macaroni in large casserole dish (2L), and pour sauce over macaroni and stir well. Bake uncovered for approximately 30-40 minutes and nicely browned.